Trust us, we understand that it is really easy to get caught up in the daily struggles and routines of life. Life is busy already, right? How can you possibly have the time? By switching it up a bit and doing some selfless service on a local level, you can make direct and positive change to your community and the lives in it. It doesn’t need to be a huge time commitment! Any level of giving helps. At Forward Training Center alone, there are countless opportunities for volunteers to make a direct impact and change the cycle of poverty in our community. When you volunteer locally, you are immersing yourself into a whole new group of people you may have never met before! Volunteering and giving is a great way to stay connected to what is going on in your community. Whatever your volunteering outlet may be, it is improving the overall community environment, and in some way, the livelihood of an individual. 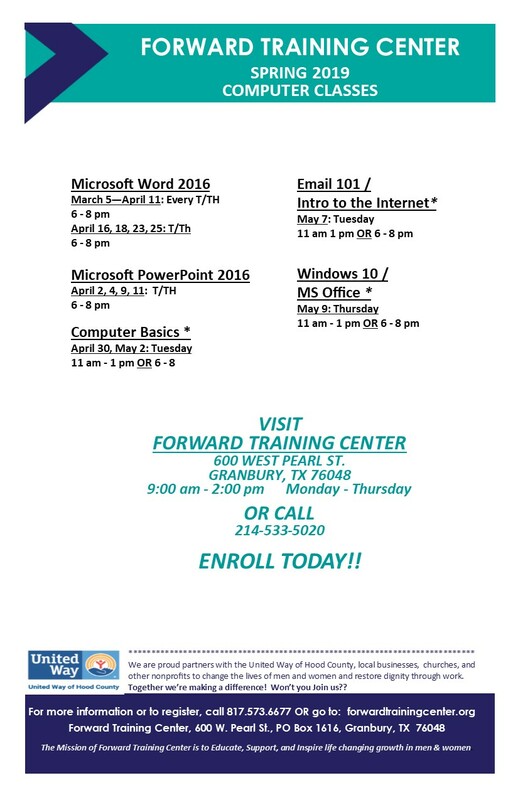 At Forward Training Center, we teach faith-based classes and instill confidence and many other professional experiences to give our students career options and change their lives. Our goal is to eradicate the cycle of poverty in our community, and in doing so, it will only help our community become better and better. You can be a part of this change! Volunteering is not only a great way to dive into a new career path or set of hobbies, but it’s also a good way to learn some skills that you haven’t before! Whether it is environmental, influential, poverty-focused or much more, you are developing skills you will have forever! We believe there aren’t many things that compare to the feelings of community togetherness quite like volunteering and giving back. It unites people to one cause, a cause that makes a change! With everything going on in the world today, it’s easy to feel like one person can’t make a difference. But you can, and especially by uniting together! Every big change starts small at first. Let’s face it, giving back feels good. Really good. Can you imagine the impact that would be made if everyone considered giving back and volunteering locally? We promise, once you start, you won’t want to stop! Consider what you are passionate about, and think of this as a chance to act on that passion. Pursue what you feel strongly about, such as children, the environment, or much more. And who knows? By volunteering, you could get directly involved in career options to make your passion your full-time job. There are great resources out there to help you find local causes you are interested in. See several different resources we found for you here, here and here! We saved the best for last! Change a life. It is always our goal to change lives. You can be a part of it, too. Wherever you decide to devote your time, we hope a driving factor in your decision to give back is to positively change the lives of others around you. Let’s make the world a better place! Start in your community today.